From Baylor's most iconic symbol comes its resounding voice. In the iconic, gold-clad tower of Pat Neff Hall, at the heart of the Baylor campus, resides an instrument of 48 cast bronze bells: the McLane Carillon (pronounced CARE-uh-lahn). Its crowded quarters belie the ubiquitous voice that ties generations of Baylor Bears together. Since 1939, the Pat Neff bells have serenaded students through campus and given their Baylor experience its soundtrack. Originally Pat Neff Hall housed an electronic tubular bell chime set consisting of 25 bells given by Trustee Cullen Thomas that debuted in December 1939 with the hymn "Praise God from Whom All Blessings Flow." However, the chimes inevitably wore out, and the time arrived for their replacement. Thanks to the generosity of the family of Baylor alumnus and current Regent Emeritus Drayton McLane, BBA '58, the chime set was replaced with the current 48-bell carillon in the late 1980s. Built by the Paccard Bell Foundry in Annecy, France, the carillon made its way from Europe to the Baylor campus (after some delivery mishaps sent it past Houston to Mexico, then back) and was finally dedicated on Nov. 4, 1988. The bells of the carillon range in weight from just 29 pounds to an impressive 4,370 pounds; the total weight of the instrument tips the scales at more than 22 tons. It's a load Pat Neff Hall gracefully bears in stride. 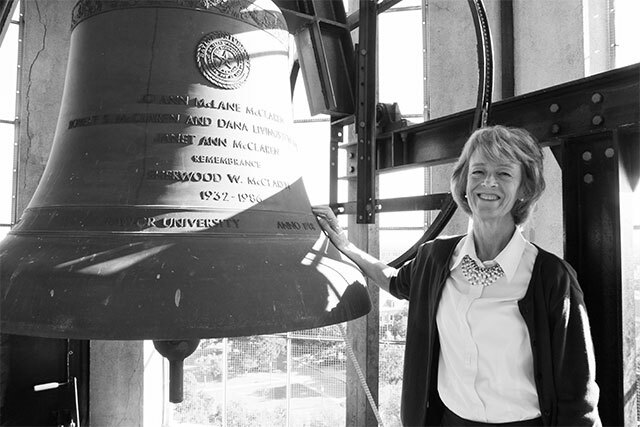 The carillon is operated by University Carillonneur Lynnette Geary, who assisted on the instrument from 1996-2006 and has been in her current role since 2006. Using closed fists and feet to operate the levers and pedals of the mechanical keyboard (called a clavier), Geary masterfully fills the Baylor air with charming melodies, hymns, Christmas Carols, and “That Good Old Baylor Line.” When she's not performing for the campus, she provides instruction to music students desiring to master the intricacies of this massive instrument. The impressive carillon has spoken to thousands of Baylor students who have crossed our beautiful grounds. So, it is only fitting that it also speaks, subtly, in the inscriptions fastened to its bells through messages left from Baylor presidents past. “No government is safe whose people are ignorant.